Voice Recorder is a built-in feature of Voice Changer Software Diamond 9.5, making it more and more convenient for audio processing and editing. 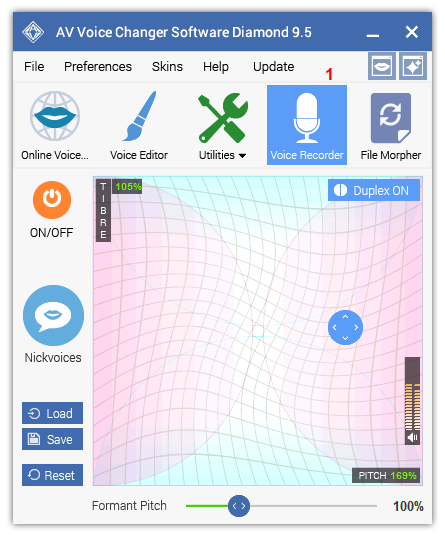 Thanks to this feature, you can morph your voice and save it for later use at the same time. In this tutorial, you will learn how to record your voice and then save it into audio files. Whether you want a record with morphing effects or just a normal voice, they are all possible. - On the main panel, choose Voice Recorder button (1) to open Voice Recorder window. 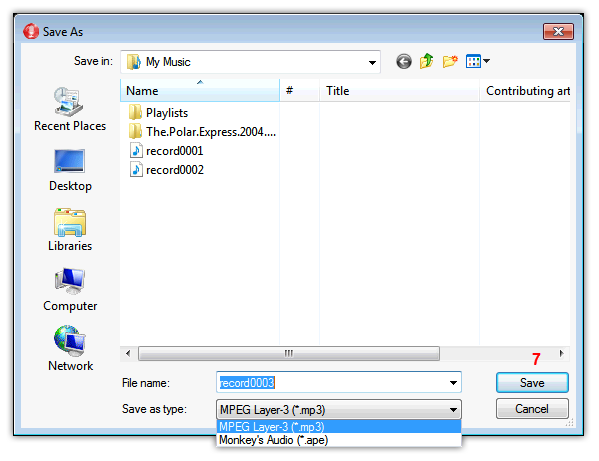 - In Voice Recorder window, move the cursor (2) of Format button. - The checked states shows that the file will be saved in Mono type with 44100Hz - 16 bit (3). If you want you can choose any encoder in list. You can choose any encoder in the list. If you are not sure which to choose, leave it at default. - Click on Select recording device drop down list (4) to choose device to record. 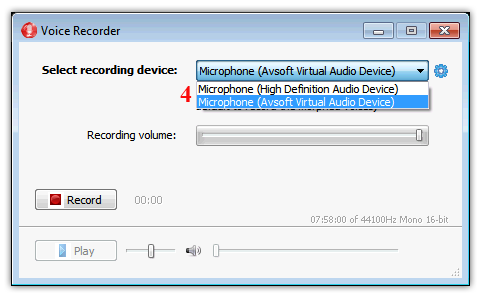 - Choose Microphone (Avsoft Virtual Audio Device) to record your voice with morphed voice. 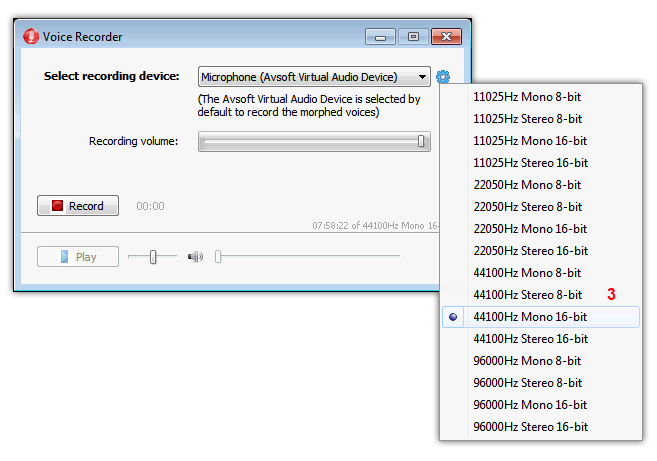 - Choose Microphone (Realtek High Definition Audio) to record your voice non-morphed voice. - Hit the Record button (5), start speaking into the microphone all your parts of script in succession. - click Stop button (6)to end the processing recording and start saving the file. - Select destination and name format for the saved file. Click Save (7) button to finish. +In this build, only *.mp3 and *.ape format to choose. - Click Play button (9) to preview your recording.